The Aston Martin DB5 is a luxury grand tourer that was made by Aston Martin and designed by the Italian coachbuilder Carrozzeria Touring Superleggera. 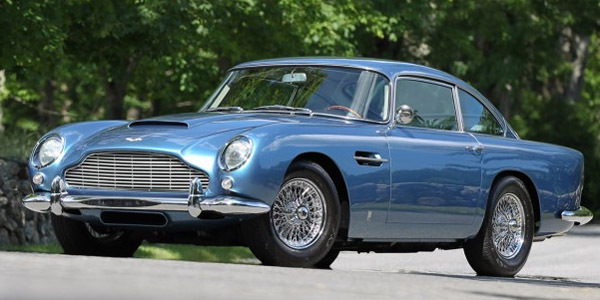 Released in 1963, it was an evolution of the final series of DB4. The DB series was named honoring David Brown (the head of Aston Martin from 1947–1972). Although not the first, the DB5 is famous for being the most recognized cinematic James Bond car, first appearing in Goldfinger (1964). The principal differences between the DB4 Series V and the DB5 are: The all-aluminium engine was enlarged from 3.7 L to 4.0 L, A new robust ZF five-speed transmission (except for some of the very first DB5s) and three SU carburetors Producing 282 bhp (210 kW), which propelled the car to 145 mph (233 km/h), this engine, available on the Vantage (high powered) version of the DB4 since March 1962, became the standard Aston Martin power unit with the launch in September 1963 of the DB5. Standard equipment on the DB5 included reclining seats, wool pile carpets, electric windows, twin fuel tanks, chrome wire wheels, oil cooler, magnesium-alloy body built to superleggera patent technique, full leather trim in the cabin and even a fire extinguisher. All models have two doors and are of a 2+2 configuration. A three-speed Borg-Warner DG automatic transmission was available as well. At the beginning, the original four-speed manual (with optional overdrive) was standard fitment, but it was soon dropped in favor of the ZF five-speed.